-Hamsters must always have access to good quality Hamster food. -Only give them specially formulated Hamster food. It is better for their dietary needs. - Avoid grocery store/large chain brands as these usually do not have the proper nutritional requirements for hamsters. -Hamsters should have access to water at all times. 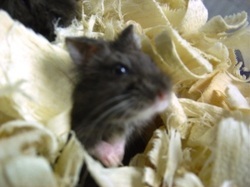 -Hamsters can have occasional snacks of people food, including breed, cooked meat, cheese, cereals, pasta, etc. - Do not feed processed human food, chocolate, onions, garlic, and other very sweet/very fatty foods. - Be careful with housing hamsters in cages with plastic bottoms or bars, as they could potentially chew through. -Make sure hamsters always have things to chew. They LOVE cardboard, wood blocks, and anything they can destroy. They are CHEWERS and must always have something to occupy their time. -Some hamsters do not enjoy being held, but they can be trained. If they nip, use gloves to handle them until they are used to you. Always scoop them up in your hands and if possible, put a cupped hand over them (Hamsters, especially dwarf hamsters, can jump and if they fall out of your hands it can seriously hurt them). The more handling the better to allow them to get used to humans. 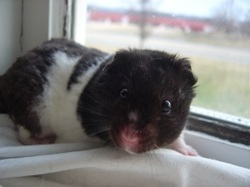 - Syrian hamsters are larger and better suited for children. They are calmer and can be more cuddly.